Character. Cost: 7. STR: 6. While an opponent controls a King character, Renly Baratheon cannot be saved. Reaction: After you draw a loyal card using insight, reveal it to draw 1 card. You cannot use duplicates (or Iron Mines, etc.) to save Renly if any opponent controls a King character. The Eyrie will still work though, because "cannot be killed" is not a save effect. Renly's ability works with any insight, not just his own (e.g. Butterbumps). Ok, this Renly is really good. Tri-Cons are powerful on their own. But he adds one of the most powerful effects, card-draw, and three icons to make that happen—and then some. Also, renown. 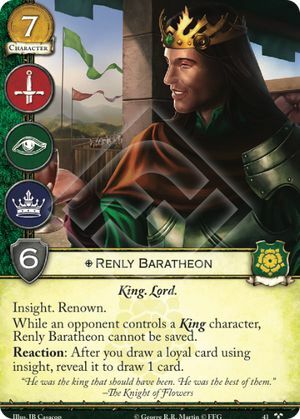 Renly has given Tyrell the boost they have needed to get back in the game, just as long as your opponent does not control a king character.